Waikiki was bustling with tourists and it was fun pushing Nolan in his stroller as we walked pass local stores that reminded me of Nigeria. 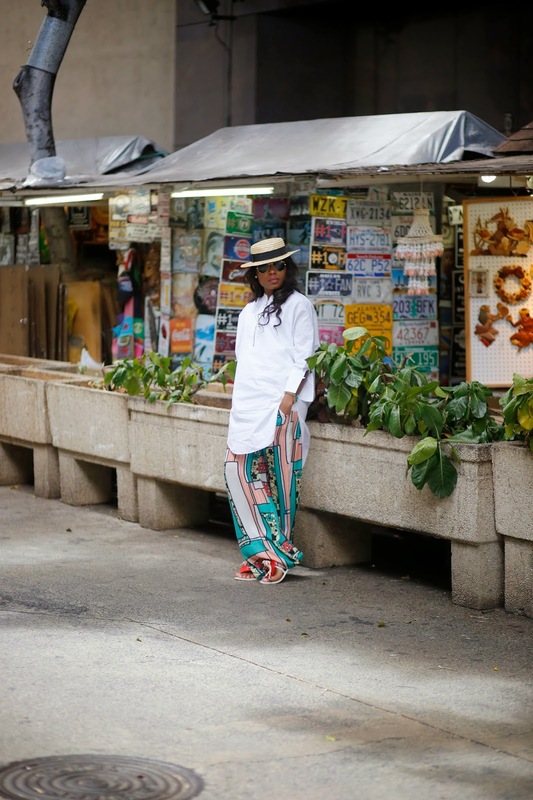 The weather was great so I wore my wide leg printed pants from Zara. I completed the look with a loose shirt-dress and my current favorite flats i.e. Melissa flats. The hat was a perfect addition to protect me from the hazing sun. You look really comfy and cute. this outfit is so perfect, I wonder if a person with full figure can pull it off. very pretty and easy look stella.love! you look so good, i love the pants reminds me of eve and tribes new pallazo, maybe i will recreate this look. and the market is so like Nigeria..
Hi Stella, I really love how your fashion style! love this comfy casual look on you. Hope you three had the best time in Hawaii.